How to Save All Subtitles and Audio When Removing DRM from iTunes videos on Windows? Renting an iTunes movie but discover the watching period restriction? This article helps you keep your iTunes rental movies on computer or your iPad/iPhone/iPod forever by removing DRM from iTunes rentals. OS X Yosemite official version is availble for free downloading for all Mac users. 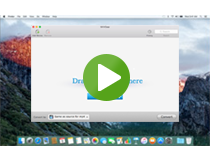 M4VGear has also updated its version to support removing DRM from iTunes videos on OS X Yosemite. This article provides the specific guide. Do you want to share videos with others on your website? Do you want to increase your website traffic by embedding videos on your webpage? Here the article introduces top 3 ways to embed iTunes DRM protected videos on a webpage. It will be a gorgeous experience to enjoy your purchased or rented iTunes videos at your home cinema. With M4VGear for Mac/Windows, you can get DRM-free iTunes videos with 5.1 audio kept. Here is a selection of the top 3 DRM removal software which can remove DRM legally and convert DRM M4V to unprotected formats so that you can enjoy the DRM-free videos on any Android/Windows device. M4VGear DRM Media Converter is a professional DRM remover to help you remove DRM from iTunes Video with Subtitles(Closed Caption) Preserved. Many people have complained that they have purchased iTunes Extras from iTunes only to find that they are not compatible with Apple TV. So how to get rid of it? Guide on how to use M4VGear DRM Media Converter for Windows to fast and losslessly unlock iTunes DRM-ed M4V videos to various video formats for playing on Android smartphones and tablets. Spent a whole day on streaming iTunes movies via Plex Media Server, but in vain? This article helpe you seamlessly stream HD iTunes movies via Plex and watch your own movies conveniently on every devices in your house.